Condos and apartments rarely offer much opportunity to garden, even with balconies or patios. ApartmentTherapy.com recently rounded up container gardening tips that will help satisfy small-space green thumbs. Some are viable even in apartments with no outdoor space at all! 1. Ceramic Pots – Dwarf fruit trees, such as Calamondin Orange, Eureka Lemon, Improved Meyer, Orangequat, Persian Lime and Ponderosa, do well in ceramic pots. Consult with experts at your local nursery for the proper mix of soil. Ensure the trees receive plenty of sunshine and regular watering. 2. 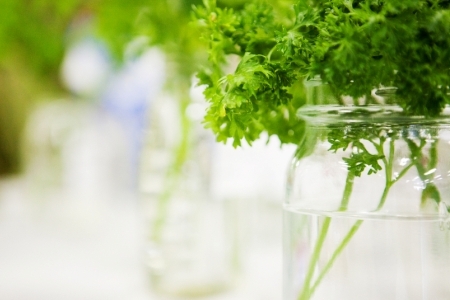 Jars – Plant slow-growing herbs in mason jars, which can be purchased at your local hardware or housewares store. Mount them vertically on a board out on the patio, or set them out on your kitchen counter, tied with decorative ribbon or rope. 3. Shoe Organizer – Hang up a vinyl shoe organizer, and fill each compartment with potting soil and plants, such as mixed salad leaves, herbs, sorrel, peas, and mini tomatoes. 4. Water Container – Container water gardens are a collection of submerged potted plants. Pots with dark interiors give the impression of depth and discourage algae. Place bricks below the surface to vary the height of the plants; tall grasses, cascading species and water flowers are ideal. Top up the water in your container every few days. 5. Wine Boxes – Buy (or wheedle a few) wooden wine boxes from your local liquor store. Place them on a table or on the floor of your balcony or patio. Fill them with potting soil and small-growing plants, like cherry tomatoes, radishes, some lettuce varieties and herbs.